A couple of months ago we asked readers What Would You Like to See on Your Marketing BFF… and a number of you suggested marketing tips and strategies you could do quickly! 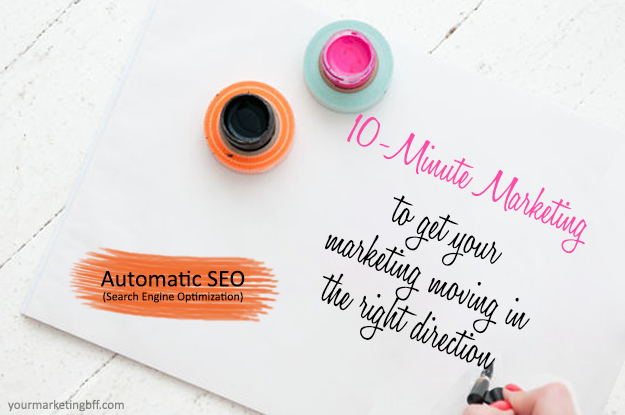 10-Minute Marketing is a quick, marketing strategy you can start doing immediately. This is a way for you to start taking ACTION towards marketing your business with just 10 minutes of your time! Objective: Brand every blog post, page and image. One of the best ways to promote and market your website so that it will show up on major search engines like Google is to brand every blog post, page and image. Improving keywords and phrases on each page will market your business to customers that fit what you have to offer. Your title should be relevant to the topic on the post or page. And the keywords or key phrase should be present in the title. Select the right keywords to boost your SEO ranking. I’ve explained how to find keywords and phrases in How To Optimize Your Site Using SEO, so go here once you’re done reading this post. Make the first three sentences count. 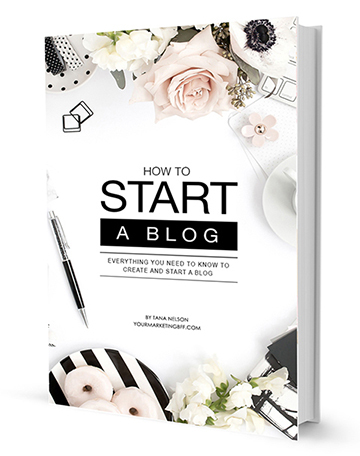 Explain what your reader can expect from the beginning, the middle, and the end of your blog post or page within your first three sentences. Note: Your keywords or key phrases should be within these first three sentences! Why? You only have a few seconds to translate value to a new visitor, so don’t make them guess. Before you upload and place your image, give it a descriptive file name, one that relates to your key search words. You’re going to want to have a file name that you want the image (and your website) to rank for. For example, we did a DIY Coffee Cup Wrappers post for businesses to create their own branded coffee cups. Instead of leaving the image as DSC123 or describing it as Image1, we named the image ‘coffee cup wrapper’. 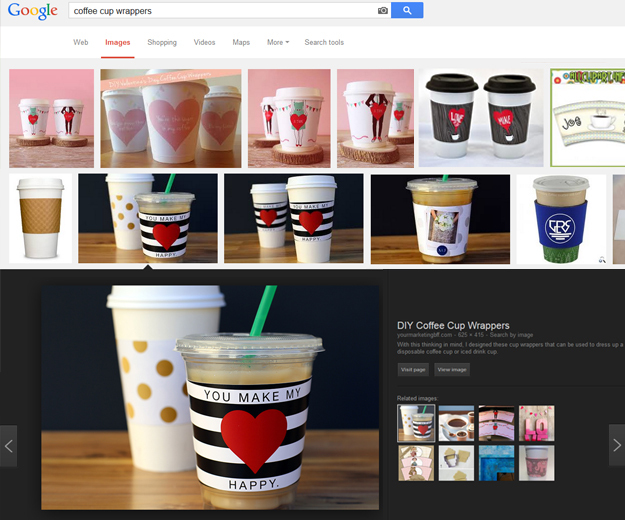 If you want to see this in action, do a ‘sample’ search for coffee cup wrappers and view the images that show up under the search term. Notice how my image and the images of others almost always have the keyword you searched for in their file name. Use keyword text, not ‘click here’, in your links to previous posts. The text you use to anchor a link is important and should be keyword related whenever possible. For example, see how I linked the text How To Optimize Your Site Using SEO (under #1), instead of click here. Why? Because anyone searching for ‘how to optimize their site using SEO’ is unlikely to search for ‘click here’. Are you already doing these search engine optimization tips? If not, give ‘em a try and you’ll start reaping the benefits! When you talk about branding images, do you also mean including your logo or name on the images you post (like you did on the first image in this article)? I understand some photographers don’t want their images edited even if you give them credit. I know there are sources for free stock images, but those can be lacking. Is the best option to purchase stock images? Yes, I was referring to branding the image (including your info directly on the image) AND the image filename itself. Note: I don’t usually include my logo or name on my images (this is really just a personal preference of not wanting to take away from my design/image) but, this is really up to you/your business. If I had a photography or food blog business online, I most definitely would ‘brand my images’ (include my logo/name or url) on every photo, especially with all the sharing that occurs in social media (like Pinterest)! In your post, placing your business logo/name on the image with a title is PERFECT for your business. Why? Because this image will get passed around on Pinterest and people will know just by looking at the image what your ‘post link’ is about + it’s promoting your business at the same time. 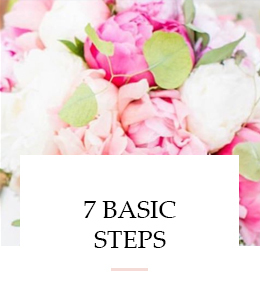 I included branding on my first image in this post because I knew I’d be promoting this new series on Pinterest and I wanted to make sure it was crystal clear. (FYI: I was thinking of this image as sort of a ‘billboard’ for this new series). Photos: The best option is to have your own images (if you know how to take great pictures) and then you don’t have to worry about it…but this isn’t always realistic! In your case, I’d form a relationship with a local photographer and form an alliance (perhaps do a trade for services, if applicable). This can be a win/win relationship for the photographer and your business. You are promoting each other’s business – and the photographer has a TON of images for you to pull from. When our clients don’t have their own images, a lot of times we’ll purchase stock images (from sites such as istockphoto.com) – we can usually find something of quality that represents the brand of the client. Whew – I’m winded this morning. Hope this clears things up! P.S. Branding on the image itself doesn’t help SEO because the ‘robots’ can only search words… which is why the filename clearly defined is so important – the ‘robots’ do search filenames! Very helpful – thanks for the reply! Thank you for this! SEO is super intimidating to me, but this is very helpful! You’re welcome Amanda! Being able to learn (and do) a few simple SEO things well, makes it not so intimidating. I’m glad this is helpful.